Windows Ultimate Extras is losing value faster than the US dollar as one of the few “extras” is soon to be superseded by a free third-party application that works not only on Vista Ultimate, but Home Premium and Business versions as well. That extra would be DreamScene, that third party would be Stardock and that application would be DeskScapes 2.0. Those grumpy looking people in the corner would be Ultimate Extra advocates. Tomorrow, Stardock will announce DeskScapes 2.0 – the second version of its desktop background visualiser tool for Windows Vista. Formerly DeskScapes was an extension to the DreamScene extra, allowing for dynamic generated “Dreams” on top of just the motion videos allowed by DreamScene itself. 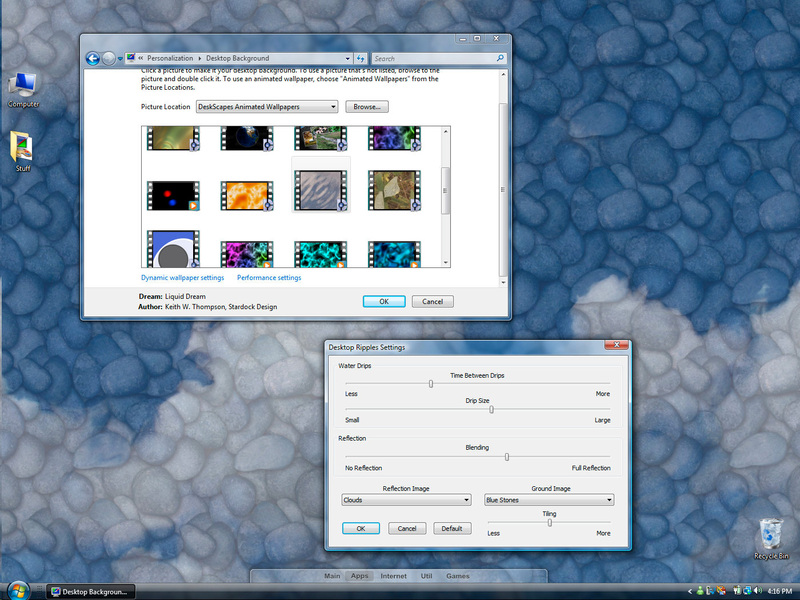 Now, both formats will be supported by DeskScapes 2.0 without the requirements for DreamScene or Vista Ultimate. 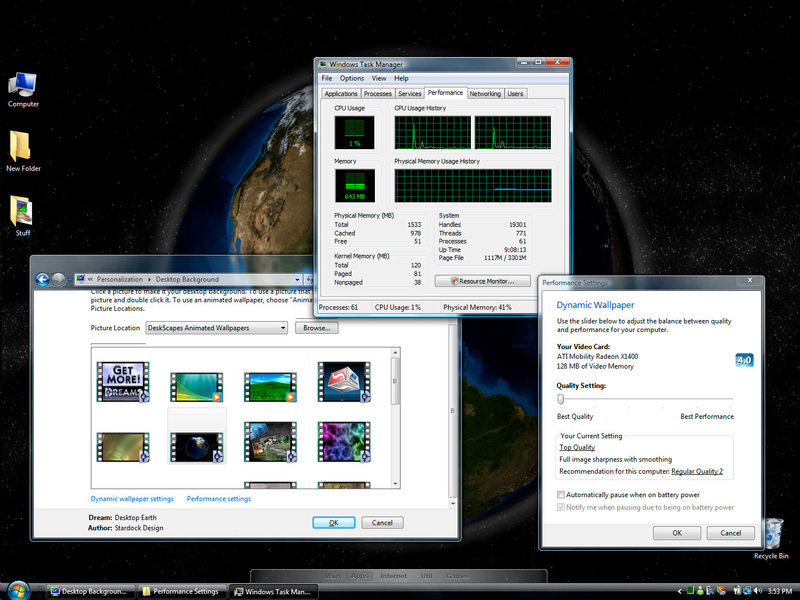 Supplied screenshots by Stardock: (Left) DeskScapes uses little resources even to render dynamic backgrounds. (Right) Dynamic dreams support a range of configurations to customize the experience. Bit of interesting background, the implementation of an animated desktop feature in Windows Vista was actually first developed by Stardock. They then demonstrated the idea to Microsoft who partnered with them to produce the Ultimate Extra, DreamScene along with a batch of its original content. Stardock then shifted its focus on DeskScapes – a free extension to DreamScene which allowed for dynamic renderings instead of just static video, as well as a community to share user-generated Dreams. As you might the same question I asked when I first heard about this, how Microsoft will ever approve of this? It’s basically slicing a huge portion of the already miniature Ultimate Extras cake to share with everybody. But it turns out Microsoft is fully aware of this release and Stardock’s involvement in the original Dreamscene is only as a content-provider. Freeloaders will be glad to know the standard version DeskScapes will be available for free, and there will be an enhanced version with “additional features and premium content” for $19.95. Although it’s not clear what those additional features are, which may or may not be the features described above. But in the least, many more users will have access to the basic functionality of animated desktops. DeskScapes 2.0 is scheduled to be released in February of 2008, but a beta version is expected soon. I’ll tell you what would be sweet, if the desktop was interactive. If you had water, your windows would float and give off ripples or waves if you moved them. Sand would move around, rocks would roll around as you moved your windows… that stuff would be fun. Videos of low res waterfalls on my 1080p monitor… nope, don’t interest me. – not able to create .DREAM from “all” videos (just .mpg .mpeg and .wma are working) and you can’t even create .DREAM from .DREAM files… BAAAD.. because of the rights of .DREAM? pfff they just have to put a list of dream used in the dream that’s all ! that’s nothing good… and it’s slow… it’s not fully compatible .. and it’s just playing a video …. even my tuner tv does better with TV as background. we need interactivity and modularity .. but we have NOTHING ..
Drempels was my first look at an animated desktop. It even worked in win98. I always thought about this as being a waste of CPU/GPU, but I can see the draw for others. I agree with Chad, interaction with the desktop background would be very cool. good luck trying to sell me on anything ever again…. Looks like the folks who got Ulimate will rejoyce! Hopefully MS keeps this trend going. No truer words have ever been spoken..
well its march 2008 now and still no deskscapes 2.0 tought it would be there in february ? april, and still no deskscapes 2.0. now i’m using Screen2Dream to animate my desktop (freeware, http://www.dreamscene.org/download.php), works fine on XP and Vista. With Screen2Dream you can run any screensaver as wallpaper, well its not dreamscene, but i like it (its nearly the same effect).